We’d love your help. Let us know what’s wrong with this preview of Ancient-Future Worship by Robert E. Webber. Rooted in historical models and patristic church studies, Ancient-Future With the many models of worship available, choosing a style to worship God can be a bit overwhelming. Is it better to go with traditional or contemporary models? Christians may find themselves asking how early believers worshiped and whether they can provide insight into how we should praise God today. To ask other readers questions about Ancient-Future Worship, please sign up. 3 and a half, didn't finish the book entirely, skipped around a bit here and there depending on the section. But overall, I like what I had read. Though there were some parts that I still need to flesh out. Webber is a gem. His chapter on the Eucharist is worth the price of the book. This book brings readers back to the early church's definition of worship: worship does God's story; it remembers what he has done in the past and anticipates what he will do in the future. I love this definition of worship. It really expands the way I perceive worship and my life. My life can join God in his story, whether that is through work, school, ministry, relationships, or music. However, I gave this book 3 stars because I disagreed with a lot of his arguments and conclusions. Nonetheles This book brings readers back to the early church's definition of worship: worship does God's story; it remembers what he has done in the past and anticipates what he will do in the future. However, I gave this book 3 stars because I disagreed with a lot of his arguments and conclusions. Nonetheless, it is still an interesting book that brings the reader back to what ancient worship was like. For traditions (like the Anglican) that never lost the ancient traditions, this book does not have much to offer. It critiques both shallow contemporary worship and tired, stagnant worship. Let's hope we can all work to invigorate worship as, in the author's words, "doing God's story." Solid book. not perfect, but lots of good wisdom for church leaders and it points out much of the empty worship we see in the western church today. I would take our congregation on a journey to rediscover the narrative of God not just through the incarnation, life, ministry, death, resurrection, ascension and coming again of Jesus, but through the greater narrative that threads its way throughout scripture to include all creation. This is the context of our worship where the incomprehensible and invisible Father is communicated through the comprehensible and visible world. As Webber clearly states, this centers around the Word and Table tha I would take our congregation on a journey to rediscover the narrative of God not just through the incarnation, life, ministry, death, resurrection, ascension and coming again of Jesus, but through the greater narrative that threads its way throughout scripture to include all creation. This is the context of our worship where the incomprehensible and invisible Father is communicated through the comprehensible and visible world. As Webber clearly states, this centers around the Word and Table that church history reveals as two points of contention. My own British culture (where the Table is celebrated every week) adds an opposite vantage point to the Table celebrated in the American context, where it may only be celebrated 3 times a year. Every Sunday should be a time to gather together around the Table not as something we do, or simply remember the work of Jesus, but to realize that we are in the narrative of God from before the Garden of Eden through to the hope that Jesus will return for us in person. Convenience and manpower may be the reason the Table is not celebrated in the American context, fueling the negative fact that the full story of God is being lost. Added to this is the drive for therapeutic sermons, tips and techniques for living with principles for personal success. The two extremes of objective and subjective sermons fail to connect the reader, preacher, teacher and congregation to participate in an ongoing narrative where the end-game is assured. We are left to our own analysis of spiritual life according to our personal success! How can the story of God be totally objective (worship towards something or someone) without it being subjective (how worship transforms me)? And how can this wonderful story be totally subjective without the objective who is Jesus? Word and Table have been argued and fought over with the Early Church Fathers and refined through Reformation but disemboweled by our present culture. To rediscover the narrative of God will dramatically transform the way we do church on a Sunday. It will challenge the programs we offer from nursery through senior ministries. It will question the church board and where money is spent and change the direction of property and building projects. To enact the narrative of God every Sunday through the songs we sing, the Bible that is read and preached, and the Table will not challenge our professionalism, but control the man-management of it. We will not be standing over the Bible questioning it, but living within its narrative with Abraham, Isaac and Jacob from the Old Testament with Peter, James and John from the New Testament. The journey of rediscovery may need new leadership or redefined leadership - either way it is the leadership that must experience transformation first. How would I summarize this to a friend? I am assuming in this case that the friend does not come to church but is curious about what happens. I would tell him that in a local church you can observe the enactment of the whole Christian story from the songs we sing, the Bible that is read and preached, to the Table and prayer among the group of believers. There would be a transcendent sense of `something greater than myself' happening not just a re-telling. It would rise above culture and tradition to participation with Jesus' Spirit telling of the past, present and future. The `telling' would be the goodness and relentless faithfulness of God in what he has done for us, is doing for us and will do for us. The emphasis is not just `us' (the subjective) but `God' himself (the objective). I would tell my friend that remembrance and anticipation are part of the Christian practice. Although Jesus is our Savior who has completed the work of Salvation for us, he continues to work as the Mediator of his completed work in our lives. This is where remembering and anticipation come together so the church is not a museum of `what happened' but `what continues to happen' in the lives of humanity. We remember that what God has already done for us we cannot do for ourselves. He has done this in the person of Jesus his son. This wonderful salvation does not just affect humanity but all creation. This would be most tangible around the Table where the bread and wine do not simply remind us of the perfect body of Jesus that was crucified, buried, raised and coming again, but the whole story of God that includes the incarnation where Jesus became a human in every sense. He was utterly dependent upon the Spirit's work within him with no supernatural advantage that is not available to us after the Day of Pentecost. In the two symbols of bread and wine remembering includes all creation that eagerly awaits the return of Jesus to be made new. This means we anticipate Jesus to return not just for us but for a new heaven and earth. Although this is something I would tell my friend, I would also remind him that we are still rediscovering this fact of God's narrative and therefore tend to perform like actors for an audience who give money if they are pleased, paying for another act the following Sunday. I would strongly emphasize that what several cultures have dissected takes a generation to restore like the historical Reformers. All this should build a rich God-human relationship and transform human relationships. The simple act of serving `others' at the Table and participating in songs that sing out the narrative with `others' demonstrates the anticipation of every tribe, nation and language together with Jesus before the Father. This is not politically framed or organized to make a point. In taking the bread and wine as symbols of God's wonderful story, it transcends color, culture, gender and generation. It is one loaf we receive from as Jesus is one Savior. This is a supernatural experience whose only reference point within humanity would be the stroke of midnight between December 31st and January 1st 1999-2000. As the midnight moment struck across each time-zone people of mixed cultures and traditions combined in a world celebration around a new millennium. The failure in this reference is that it can only be experienced once every one thousand years eliminating multitudes from participation. Another failure would be the temporary theme that `went' as fast as it `came' but did not remain. We can remember it but anticipate nothing more. Therefore the relationships forged through this momentous occasion quickly dispersed back to what they formally were. The Table does not allow for this (as long as it is truly practiced) and the central theme of the Word (Jesus) does not exclude but includes and embraces. Again, as long as the Word is truly read and preached with the practice of the Table, the focus and theme is not `us' but the narrative of God. He became, has become, and continues to become the root of all God-human relationships through the lens of worship as we read and hear the Word whilst celebrating the Table. Weber does a wonderful job of starting the reader on a journey to recapturing their place in the story of God. Worship is not about singing or preaching or even the table. Rather worship is about God. Our singing, proclaiming and Eucharist all remember what God has done, point to what God is doing in the world, and to what God will do ultimately when His kingdom is fully consummated. As a Christian raised in the west who has committed to minister and lead worship at his local church, this book really stretched, inspired, and challenged me. It deals with the overarching story of God through history and calls in to reflection every aspect of our Worship services today. Webber's book helps you see worship in the Church within the historical practice as well as today's, and I'm forever grateful for the journey. This book was incredibly pithy and insightful. It is rare to come upon a book that contains such serious and deep theology but is expressed in practical and plain language. Webber’s book is a treasure. I plan on handing out copies to any who will read. An interesting discussion on what is true christian worship, and what evangelicals can learn from the ancient church fathers, and the Eastern church. I had mixed feelings on this one. Overall, a good book that does a great job of describing the narrative of Christian history. It also gives a very good account of Christus Victor atonement. Webber's thesis is that something has been lost by Western churches after the ancient era. On the other hand, I found Webber to be somewhat condescending and parochial. According to Webber, the Eastern Orthodox churches are the only ones that "get it right," and he is very dismissive of modern western churche I had mixed feelings on this one. Overall, a good book that does a great job of describing the narrative of Christian history. It also gives a very good account of Christus Victor atonement. Webber's thesis is that something has been lost by Western churches after the ancient era. On the other hand, I found Webber to be somewhat condescending and parochial. According to Webber, the Eastern Orthodox churches are the only ones that "get it right," and he is very dismissive of modern western churches, especially Catholicism. Probably the biggest issue I had with the book is that Webber's model of Christian life and worship was that Webber's divine narrative of Christian history had very little to do with the life and ministry of Christ. Webber does great justice to the Incarnation and Resurrection, but he basically ignores the life of Christ. This manifests itself in a model of Christianity that is completely absorbed in remembering the past to the neglect of the transformation of the world in the present. One of the great strengths of Christus Victor atonement in my opinion is that it lays a theological foundation for the redemption and transformation of the world and the self. Webber's idea of transformation was eschatological, something that we should anticipate and praise God for but not actually do anything about. As much as I loved Webber's narrative conception of worship in the Church, I got an image of a Church facing in on itself and trapped inside its own four walls. Webber has a great appreciation for God's activity in the past, but he does not show much concern for God's activity in the present. This is the first Webber book I have read. I was originally uncomfortable with his ideas (about five years ago) but having recently been dismayed with all modernist Christianities (be they liberal, Evangelical, or some Reformed), and given a recent interest in Patristic thought, I decided to give this book a chance. 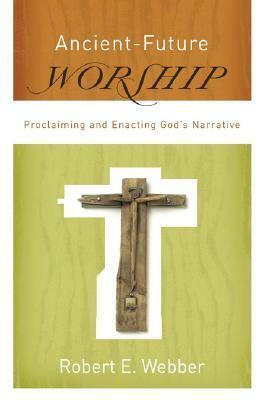 Webber defines "ancient-future" worship as "publically enacting God's narrative." The worshipping church tells God's narrative, which Webber carefully defines, following the Eastern tradition, as "Creation-Incarnation-Recreation." Given this, an ancient-future church will proclaim God's Scriptures as "true," but not merely in the Enlightenment style of "proving the Bible." Ancient-future worship will climax in the Eucharist. Don't worry, he isn't advocating Roman transubstantiations. His "Word and Table" model, in my humble opinion, is the best I have ever seen. The Eucharist tells the story of the Incarnate, who while being in the womb of the Virgin, united humanity to his nature so that he may redeem humanity and the world. The bread and wine symbolize the life of the world; the life being given to the world. Christ is really present. The Patristics, contra the moderns (be they conservative or liberal), saw the reality inherent in a sign. Webber's the person any young or old evangelical needs to read who is interested in a Christianity that is rooted in the early church's faith and practice, but also ready for the challenges of our present time. Before you convert to Orthodoxy, Catholicism, Anglicanism, or Confessional Lutheranism, read his Ancient-Future series. Ancient-Future Worship emphasizes God's story as the basis for worship. It's about us connecting to the narrative of what God is doing in the world through word, song, eu Webber's the person any young or old evangelical needs to read who is interested in a Christianity that is rooted in the early church's faith and practice, but also ready for the challenges of our present time. Before you convert to Orthodoxy, Catholicism, Anglicanism, or Confessional Lutheranism, read his Ancient-Future series. Ancient-Future Worship emphasizes God's story as the basis for worship. It's about us connecting to the narrative of what God is doing in the world through word, song, eucharist, and community. We embody God's story, we celebrate it through the Christian year, we remember and reenact it through communion, we sing it and proclaim it through songs and scripture readings. Robert Webber makes a great point: Worship is about God, not about the worshippers. His writing about how differing traditions have placed emphasis in different aspects of this. The book is exhaustive and complete. That is its problem. Webber makes his point and then remakes it and then remakes it and then remakes it. I am very sympathetic to his argument, if only he'd just make it an move on. Webber addresses problems in current worship (both contemporary and liturgical) and examines ancient (4th century and before) worship practices in consideration of what has been lost. A very insightful and useful book. Interesting read...sometimes broad generalizations are made, so keep the broader picture/context in mind. Anything by Webber is great. This book really takes you back to when the church was formed. There are many good themes that could be brought back to our congregations today that would spark Christ like behavior.